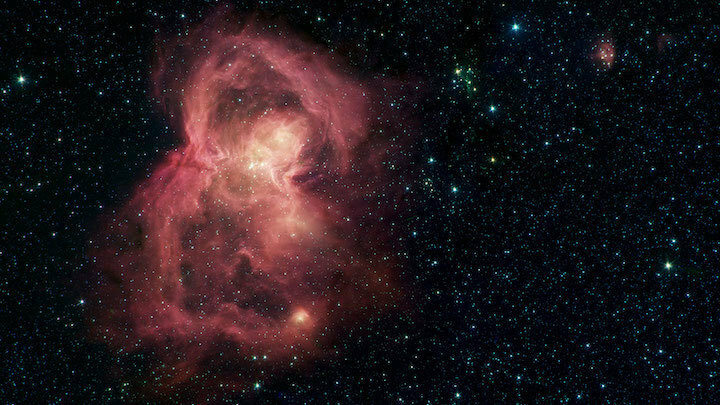 What looks like a red butterfly in space is in reality a nursery for hundreds of baby stars, revealed in this infrared image from NASA's Spitzer Space Telescope. Officially named Westerhout 40 (W40), the butterfly is a nebula - a giant cloud of gas and dust in space where new stars may form. The butterfly's two "wings" are giant bubbles of hot, interstellar gas blowing from the hottest, most massive stars in this region. Besides being beautiful, W40 exemplifies how the formation of stars results in the destruction of the very clouds that helped create them. Inside giant clouds of gas and dust in space, the force of gravity pulls material together into dense clumps. Sometimes these clumps reach a critical density that allows stars to form at their cores. Radiation and winds coming from the most massive stars in those clouds - combined with the material spewed into space when those stars eventually explode - sometimes form bubbles like those in W40. But these processes also disperse the gas and dust, breaking up dense clumps and reducing or halting new star formation. The material that forms W40's wings was ejected from a dense cluster of stars that lies between the wings in the image. The hottest, most massive of these stars, W40 IRS 1a, lies near the center of the star cluster. W40 is about 1,400 light-years from the Sun, about the same distance as the well-known Orion nebula, although the two are almost 180 degrees apart in the sky. They are two of the nearest regions in which massive stars - with masses upwards of 10 times that of the Sun - have been observed to be forming. A mosaic of Spitzer's observation of the W40 star-forming region was originally publishedas part of the Massive Young stellar clusters Study in Infrared and X-rays (MYStIX) survey of young stellar objects. The Spitzer picture is composed of four images taken with the telescope's Infrared Array Camera (IRAC) during Spitzer's prime mission, in different wavelengths of infrared light: 3.6, 4.5, 5.8 and 8.0 ?m (shown as blue, green, orange and red). Organic molecules made of carbon and hydrogen, called polycyclic aromatic hydrocarbons (PAHs), are excited by interstellar radiation and become luminescent at wavelengths near 8.0 microns, giving the nebula its reddish features. Stars are brighter at the shorter wavelengths, giving them a blue tint. Some of the youngest stars are surrounded by dusty disks of material, which glow with a yellow or red hue.